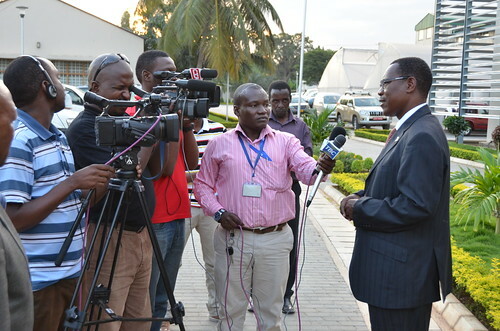 Hon Titus Mlengeya, Tanzania’s minister for livestock and fisheries development, addresses journalists after he opened the ILRI-Tanzania office in Dar es Salaam on 13 Jun 2014 (photo credit: ILRI/Paul Karaimu). The International Livestock Research Institute (ILRI) has been requested to work more closely with Tanzanian research institutions to develop appropriate technologies for fish farming and to raise the profile of fish farming in the country. Hon Titus Mlengeya (MP), the Minister for Livestock and Fisheries Development in Tanzania, made the request at the official opening of the ILRI-Tanzania office on 13 Jun 2014 in Dar es Salaam. ‘I encourage [ILRI] to work with the Tanzania Fisheries Research Institute (TAFIRI) to develop appropriate technology for farming fish fingerings and feed production for fish,’ said Hon Mlengeya, who added that the sector could benefit from ‘scientifically proven technologies of developing fish farming,’ reported allAfrica.com. The ILRI-Tanzania office is hosted by the International Institute of Tropical Agriculture (IITA) in Dar es Salaam and was opened at a ceremony co-hosted by ILRI and IITA and attended by more than 45 guests from across Tanzania’s livestock sector and local media. The minister commended ILRI’s focus on dairy value chain development in Tanzania but noted that aquaculture, goats and chicken also play a key role in providing incomes and livelihood support to farmers in the country. Speaking at the event, Jimmy Smith, the director general of ILRI, said ILRI’s work in Tanzania would ‘strength science-based practices in livestock production, focus on building capacity and incorporate food security and nutrition security for farmers’. Tanzania is a target country of the ILRI-led CGIAR Research Program on Livestock and Fish, which is working to improve smallholder dairy value chains. One of the projects under this program is ‘More Milk in Tanzania (MoreMilkIt)’, which is working with partners such as Tanzania’s Sokoine University of Agriculture to improve farmer access to feeding, breeding, animal health and credit services. Read the full story on allAfrica.com: Tanzania: Minister Makes Case for Fish Farming Promotion. Read an ILRI news story on the ILRI-Tanzania office opening: ILRI-Tanzania country office opens in Dar es Salaam. Read more about ILRI in Tanzania. Tags: IITA, Jimmy Smith, MoreMilkIT, Sokoine University of Agriculture. Bookmark the permalink.